Lean Six Sigma Black Belts lead complex, cross-functional projects, driving improvements at every level of the organization. As dedicated resources to resolving business challenge, you need to be equipped with all the critical tools. The delivered financial benefits of Black Belts who successfully complete ProcessArc’s proprietary training typically exceed $250,000. Given that standard Black Belt projects span multiple functional areas soft skills play a critical role in project success. Our training brings together the analytical tools of Six Sigma and LEAN with the soft skills of Change Management to deliver results. The key to our successful training is providing real world, industry specific case studies in the classroom sessions. Your instructors have a depth of knowledge in the healthcare sector, ensuring that in-class discussion always remains relevant. Our process takes the Black Belt from project to results that impact the bottom line:The course is two long and split into Module I & II. Prior to starting class, our instructors work with Black Belt candidates to ensure that an appropriate project has been selected. Post Module I training, an 8-12 week break is provided for the Black Belts during which they apply the in-class tools to their project. Once Module II training has been completed a comprehension test will be provided to ensure that all gaps in knowledge have been resolved. But our training does not end in the classroom. We understand that sometimes support and coaching is required after the training sessions. ProcessArc has designed options to support you throughout the process. For more detail you can contact us. Black Belts are the heart of an organization’s Quality efforts – they drive the change. A Black Belt typically spends 100% of his/her time executing critical Lean Six Sigma projects. 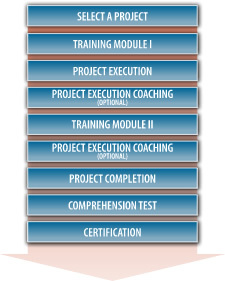 The training specifically prepares you for applying LEAN and DMAIC principles to your projects. Participants are asked to have a project identified that has been approved by the organization. We ask that you submit your project to your trainer for approval at the latest two weeks before your session is to begin. This assures that your training and certification process yields the best results following completion of the course work.